This attractively comfortable villa is fully equipped with a private heated pool,wifi and satellite tv. Ideally located overlooking the 3rd hole of the golf course with stunning sea and cliff views . Set in a attractive and quiet area, perfect for a relaxing holiday, yet with excellent facilities for the more active within easy walking distance. The Villa has various terraced areas with all day sunshine, terrace furniture and sunbeds are provided together with a barbecue , ideal for al fresco dining. The Villa is very spacious with a large lounge, flat screen television, WiFi, music centre . There are french doors leading from the lounge to a large, lovely sun terrace with the private heated swimming pool .There is a fully fitted and extremely well equipped kitchen, including washing machine along with a dining area to seat 4 people. There are two bedrooms, one with a double bed and the other with two single beds and a family bathroom/shower room. Had a wonderful time and it is a great villa. Perfectly situated in a nice quiet area but close to everything you need like bars, shops and restaurants. Did not want to leave. Josie met us on arrival and did a great job of showing us around and letting us know about the area. I highly recommend this villa. This property is well worth a visit. The owners showed us round. Everything was as it stated heated pool good WiFi and all the utilities you’d need. If anything the photos don’t do it justice. There’s a small supermarket 2 mins away along with a couple of restaurants and bars. 10 mins walk away is another area of bars and restaurants. We rented a car although you don’t really need one as the taxi rank is also 2 mins away. You are on the flight approach so there is some aircraft noise but it really didn’t bother us. There’s no aircraft noise at night. It’s a quiet area and you can chill out by your own pool all day. Really relaxing. Everybody was so easy to deal with. We would definitely stay again. We had a fabulous break at this villa. We were met by josie a lovely lady who showed us around and gave us help on where to shop and eat etc. Having the space, everything we needed and the private pool made for a totally relaxed and enjoyable holiday. The area is great with some lovely walks and bars and restaurants around. We didnt have a car but found taxis easily and they were very reasonable. Would recommend and would stay again. Wir waren zu viert (2 Paare) in dem Haus. 11 Tage Anfang April 2018. 5.) die Töpfe sind das billigste vom billigen. Beim Kochen hat man sich dauernd die Finger verbrannt. Fazit: wenn man schon 130.-€ die Nacht nimmt, dann sollt auch das Drumherum stimmen. Hier ist aus meiner Sicht Nachholbedarf. So wie z.B. bei Grill. der ist von Weber und einwandfrei. We had an excellent stay. Really loved the villa and the beautiful views. Josie was so helpful for any help we needed! Hope we can return again soon! 2 week stay at this villa and it was perfect! It is situated in a lovely quiet spot but within walking distance to restaurants/bars and supermarket that stocks all of your essentials and more! A longer walk along the coast will bring you to the marina which has further restaurants or carry on walking intoSan Blas. 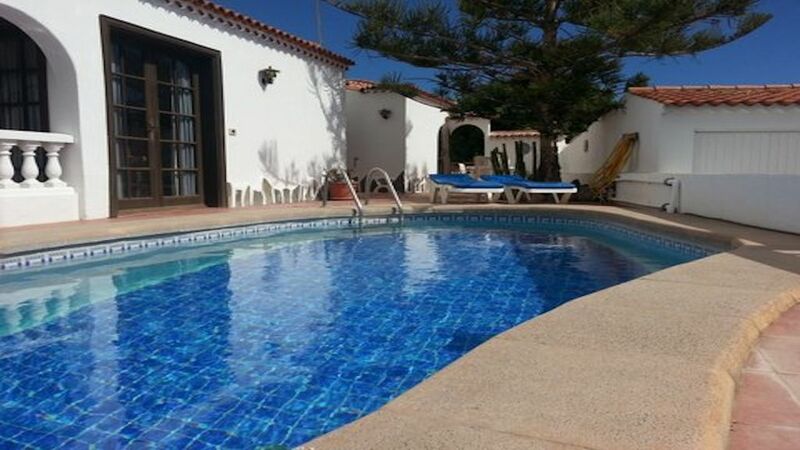 The villa is very well equipped and plenty big enough for a family to have a comfortable stay! The photos of the pool dont do it justice, its heated and maintained nearly everyday by pool guys, cover it every night and you will have no issues! I was sceptical at first in booking the villa as you hear of horror stories of people turning up and no villa being there or people lose loads of money! I couldn't have been more wrong from booking through to our stay Lesley stayed in contact with us and answered any questions I had!